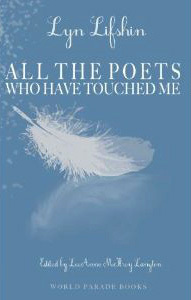 Lyn Lifshin's latest collection All the Poets Who Have Touched Me is an intimate whirlwind tour through literary history in the company of the perfect confidential guide. Lifshin, prolific "queen of the small presses" for the last several decades, must have been at least casually acquainted with some of the poets she writes about here, but to what extent only she could tell us, and this isn't a tell-all. One poem is entitled "The Poets I Know the Best Are the Ones I Could Never Write About" and begins, "It would be betrayal..."
And it would be, wouldn't it? Any poet, novice or established, tends to feel the necessity of that rule instinctively. So, having set those parameters, Lifshin puts us at ease that these poems are primarily works of the imagination, with maybe a few smuggled-in details, a few sly observations thrown in here and there. Many of the poems, like "Eating Chocolate With Edgar Allan Poe," are playful; others are candid, meditative, sensual, melancholy. so cold. Even in 3 sweaters I was shaking. Other poems tell of shared moments (often courtesy of time travel) with Byron, Keats, Whitman, Dickinson, Millay, Sandburg (who got it all wrong about the fog and cats) as well as Sexton, Ginsberg, Bukowski, Kenyon, and the list goes on. held him four hours while he cried. In the sensual "Sleeping With Lorca," she writes, "There’s/ more you might coax me to say but/ for now, it’s enough I can still smell the/ green wind, that 5 o’clock in the/ afternoon/ that would never be another time". "There's more you might coax me to say" sums up the charm of this collection. With all that is revealed of reverie and anecdote, fantasy and (possible) reality, there is always another delicious detail that might have been added, another poet who might have been befriended and revealed. It's easy to get caught up in the infectious fun as we teleport with Lifshin through pivotal moments in the lives of poets who have touched us as well, imagining with her what well might have been.